One of the best known ‘daughters’ of Blackheath was the suffragette Emily Davison, who was born at Roxburgh House, 13 Vanbrugh Park West. She was to die on 8 June 1913 following serious injuries at Tattenham Corner on Epsom Downs four days earlier. 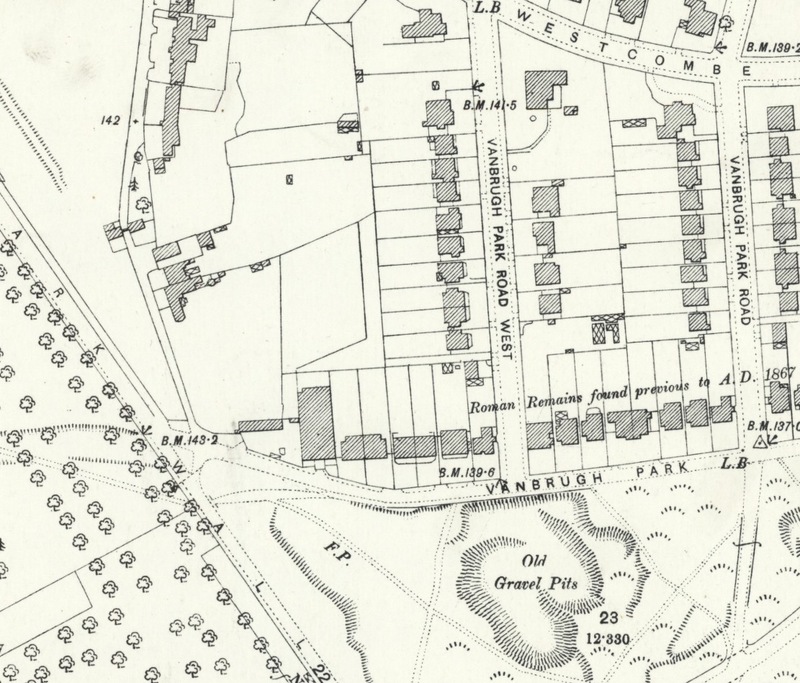 Roxburgh House was the middle house on the eastern side of the street on the Ordnance Survey map below (on a Creative Commons via the National Library of Scotland). She was born on 11 October 1872 to Margaret and Charles Davison who were both from the north east. Charles seems to have been a retired stock broker. Little is known about her early life but it seems that the family didn’t stay that long in Blackheath, while there are rumours of some time in Brockley, there next definitive location was Fulham where her father died in 1893 and the family were recorded in there in the 1891 census. As is covered below, they had certainly moved from Blackheath by the time the 1881 census enumerators called at Roxburgh and she was at school in Kensington by the mid 1880s. After an education that included periods at Royal Holloway College, Oxford and the University of London she taught privately for several years. Emily joined the the Women’s Social and Political Union (WSPU) in 1906 and was working for them full time by 1909. She was imprisoned eight times for a variety of offices including arson and stone throwing, force fed and had her cell deliberately flooded (Picture below on a Creative Commons via Wikipedia). On Wednesday 4th June 1913, Davison attended the Derby at Epsom positioning herself on the inside of the track at Tattenham Corner, she ducked under the track,ran out on the course and attempted to grab the bridle of Anmer, a horse owned by King George V. The horse hit Emily and the impact fractured her skull, she never regained consciousness and died on 8th June. 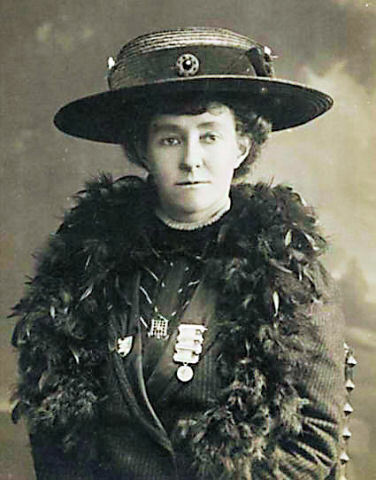 There has been much debate as to whether Emily Davison intended to kill herself in the century since her death – a new analysis done around the centenary of her death suggests that she may have intended to put a sash around the neck of the King’s horse. As for the house, Roxburgh has an interesting story beyond that of being the first home of Emily Davison and the details of those living there tell much of the decline of the area during the 20th century before its more recent emergence as a highly desirable place to live. Roxburgh was built around 1872 and the Davison family seem to have been the first occupants. It was the middle house on the eastern side of Vanbrugh Park West (1). 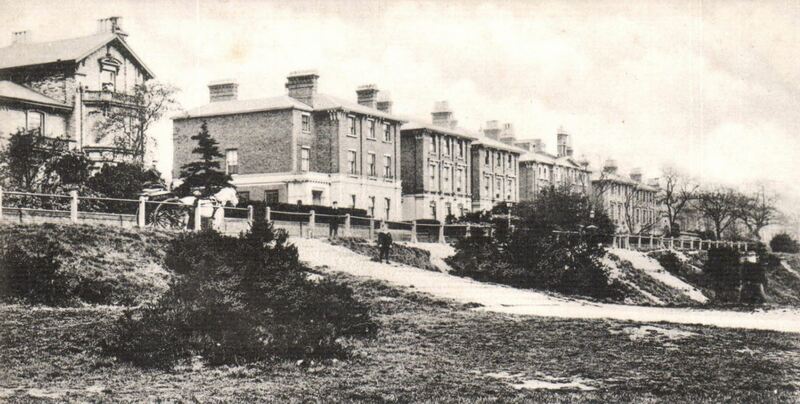 While there appear to be no photographs of the house – there are several postcards of the neighbouring Vanbrugh Park (below eBay September 2016) – whose houses were very similar. The church in the background was St Andrews – which was covered a while ago in Running Past in relation to a painting by Elwin Hawthorne. The first time the census enumerators called in 1881, Roxburgh House was home to the Matthews – Marmaduke and Martha Ann, their 7 children and five servants. They had moved there from Sutton in Surrey where they lived in 1871. Marmaduke was a solicitor. A decade later the parents weren’t mentioned, but may have been away when the enumerators called as the relationships to head of household were son, daughter etc. The Matthews had moved out by the mid 1890s to Essex, they seem to have been replaced by Alfred Blechynden a respected marine draughtsman and engineer who had moved from Barrow to manage John Penn and Sons, Greenwich shipbuilders and marine engineers, a firm he had worked for for three years a decade and a half earlier. The Blechyndens were used to a comfortable lifestyle – Alfred and Elizabeth had three servants ‘living in’ in their substantial home in Barrow in 1891. Sadly, Alfred Blechynden died from a heart attack just over a year after moving back to south east London. How long Elizabeth remained at Roxburgh is unclear, but she was eventually to return to her native north east (photo below of Vanbrugh Park – eBay June 2017). By 1901, Roxburgh was home to Robert Watson, a Lieutenant Colonel in the Army who was 55, his largely grown up children and three servants. In 1911 the house was vacant, although an elderly caretaker and his wife, Hugh and Caroline McLean were living there. This was perhaps the shape of things to come, after World War 1 most of the houses around Vanbrugh Park leases were subdivided into flats or used for boarding houses for naval students at the Royal Naval College (3). The postcard below was from eBay June 2017 would have been from this era. When the 1939 Register was compiled, the house had been divided into three flats – one was empty, another was home to the Gorsuch family – the 47 year old father, Frank, was an inspector for the Port of London Authority, his wife Marjorie and daughter Mabel (19) carried out ‘domestic duties’ while son Denis (23) was an engineer. The Willoughbys lived in in the other flat, they were retired but had a a lodger too. Most of the neighbouring houses had been similarly divided and the occupations were generally manual and clerical. There were though still a few that were lived in by single households, often with older residents. There was some bomb damage, probably from the V-2 rocket which hit neighbouring Vanburgh Park Road on 19 February 1945, with two deaths; this completely destroyed one house and seriously damaged the western side of that road. 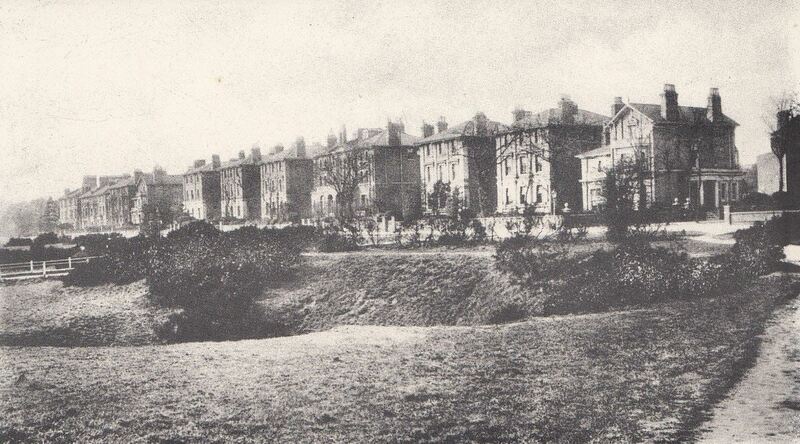 Several of the houses along Vanburgh Park Road West were damaged beyond repair, the same was the case for all the houses in Vanbrugh Park between the two bits of Vanbrugh Park Road. What level of damage was suffered by Roxbrugh House isn’t clear as the initial pink colouring, indicating damage beyond repair was whited out (4). The 99 year leases were allowed to run down by the Page Estate who had retained the freehold and would have expired in 1971. 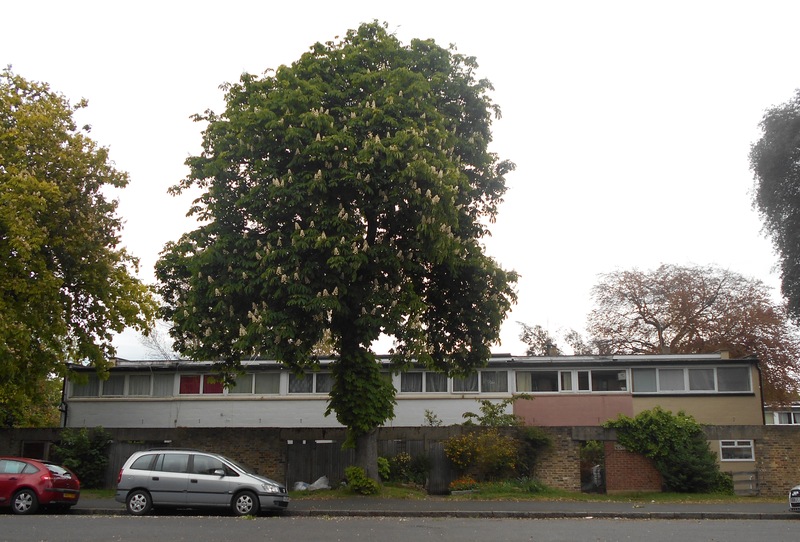 While the Page Estate opposed redevelopment they were compulsorily purchased and new local authority housing completed in 1965 – the Vanbrugh Park Estate (5). Roxbrugh House would have been just to the right of the photograph below. It was designed by by Geoffrey Powell of Chamberlain, Powell and Bon, the firm who designed the Barbican (6). 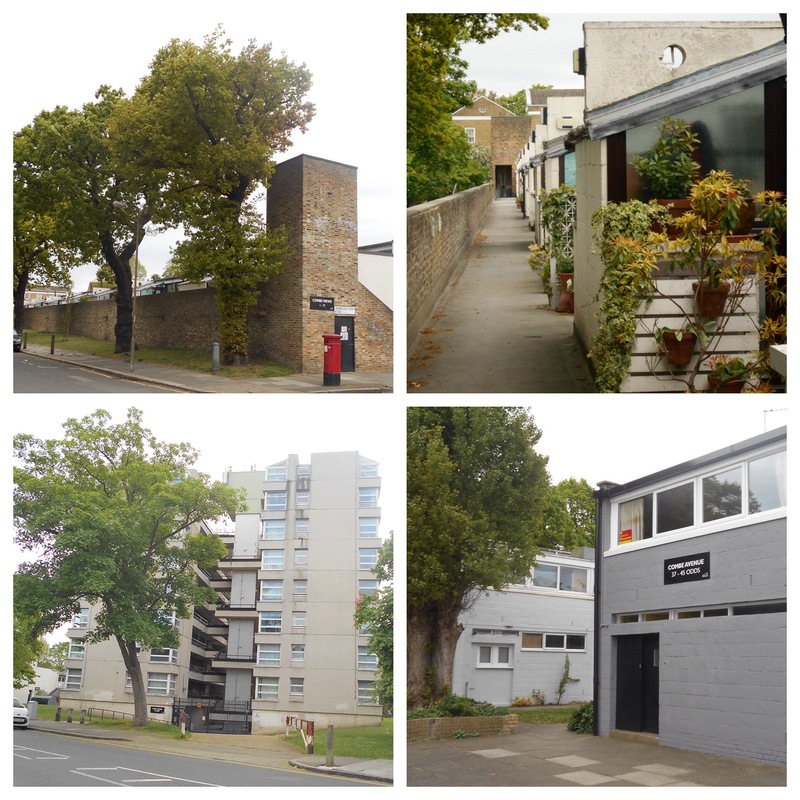 Cherry and Pevsner describe it as ‘one of the most interesting housing estates in the borough,’ an unassuming, informal grid of flat roofed terraces with ‘distressingly unappealing cheap painted breeze blocks’ (7). The savings on the building materials enabled more to be spent on landscaping. It is housing that has stood the test of time, although much of it has been sold under Right to Buy and those living there have no doubt changed considerably since it was built. Average values in June 2017 on the estate were suggested to be just shy of £500k. 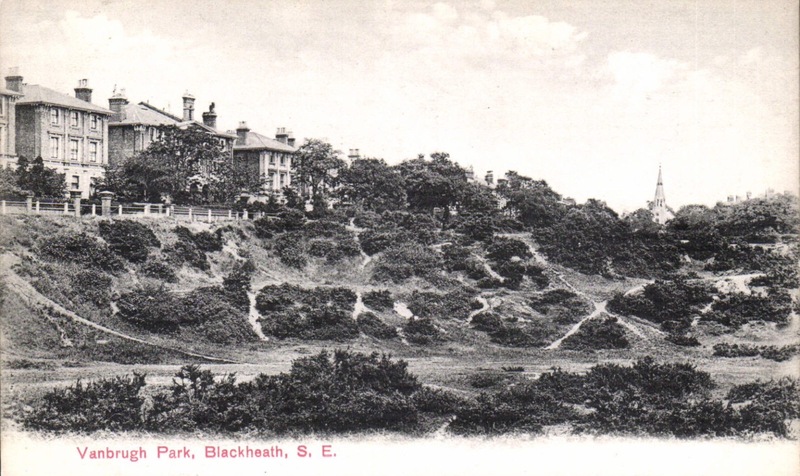 This entry was posted in Blackheath History, Rebels & Radicals and tagged Alfred Blechynden, Emily Davison, Roxbrugh House, Vanbrugh PArk, Vanbrugh Park Estate, Vanbrugh Park West on June 7, 2017 by Paul B.